This week I have the pleasure of introducing you all to Nancy, who has recently joined the OWH Blog Team as the “Tutorial Wrangler”. Tutorials will now be posted every other Tuesday here on the OWH Stars & Stamps Blog and if you have some ideas or would be interested in doing a tutorial you can reach her by email here. Nancy and her family (Husband, two teen boys and various pet life!) live in Ammon, Idaho.They are not very far away from Yellowstone National Park and they spend a lot of time in the summer just outside the park and do a ton of camping and outdoorsy type stuff! She blogs over at Scrap Happens! and she has a YouTubeChannel with some great stuff so be sure to check out her blog. How long have you been stamping? I have been stamping and scrapbooking and making cards and other paper crafts since childhood. I got real serious about scrapbooking when my son was born and I started making his baby album. Card making just kind of naturally followed – since it was a great way to use up extra supplies. These days, cards are the things that I make the most often, and enjoy the most! 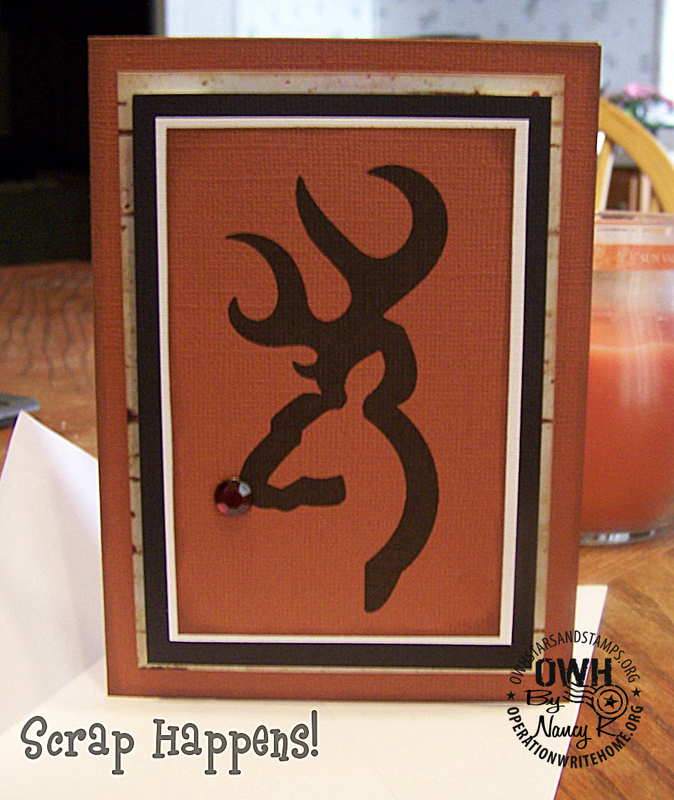 Do you have a craft room or specific area where you stamp/craft? My hubby has been generous enough to allow me to take over what was once a formal dining area. We usually eat in the kitchen nook or in the living room (bad, I know…) so this space was perfect for me. I like it because I can work at my table and still see what the family is up to out in the TV area or kitchen. My dream is to some day have a whole scrap room or even a “Scrap Shack” (one of those very nice storage buildings) out in the yard. What are your favorite stamp/craft products? I love all products, but lately I have a real fondness for edge punches, Spellbinder products, my Cuttlebug embossing folders, and digital stamps. I love heat embossing, and I could not live without my Cricut machine. I also love to find alternative items – and incorporate them into my cards in ways that may be new or fun. (See: dryer sheet cards and puff-paint cheese!) I have been known to use twigs, leaves, pine needles, pine cones, bark, real flowers and various things stolen from my husbands’ garage on my cards – much to his dismay. Do you have a favorite technique? I think that my favorite thing about techniques is finding my own, or inventing new ones. Nothing excites me more than coming up with something completely unique! I also love making video tutorials about what I do, but I am a complete nutball. Nothing about my videos is serious or professional. The lighting and editing is bad. I love to add cheesey music and sound effects. But people seem to like them, so I will keep making them, as long as people keep asking! I love to try to make digi-stamps but my doodling is not that awesome, so they don’t happen very often. Are there colors you love to include on your cards? I love jewel tones, bright primary colors, and earthy colors and patterns. As the only lady of the house, I tend to lean more towards the masculine side of things. Nobody but me seems to appreciate pink, fluffy, flowery or sparkly around here. . . but I am ok with that. 🙂 I try to make cards that men would like, so I tend to use a lot of metallics, woods, reds, browns, twines and even leather or suede. How did you hear about Operation Write Home? 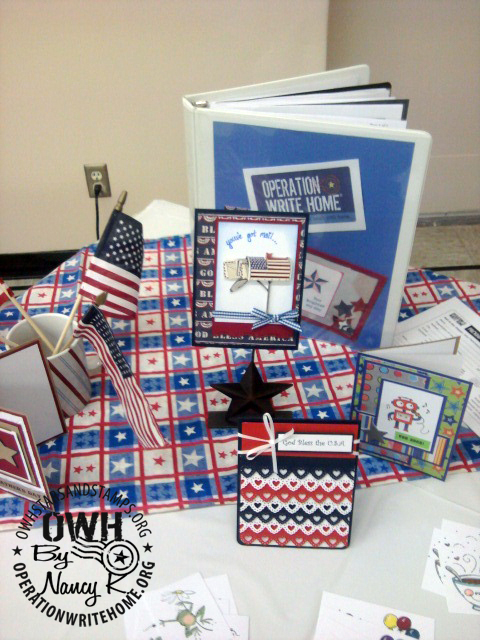 I first heard of OWH when it was called “Cards for Heroes.” A lot of ladies that I know either had sons or husbands deployed. 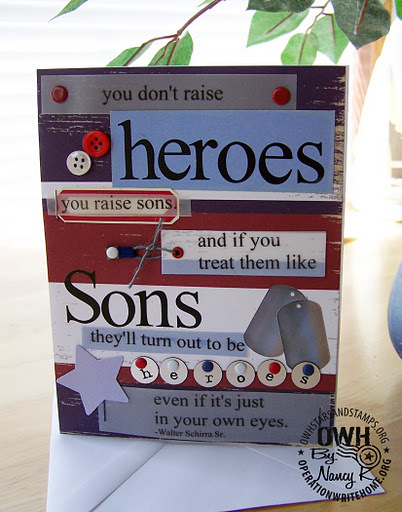 I had just made one of my first “Hero” cards for a co-worker, when her brother (a classmate of mine) was deployed to Iraq for the second time or so. Some kind of internet search I was doing brought me to the “Cards For Heroes” site and it was like magic… I had a metric TON of unused, handmade cards around the house, and found OWH to be exactly what I was looking for! I have been involved ever since. 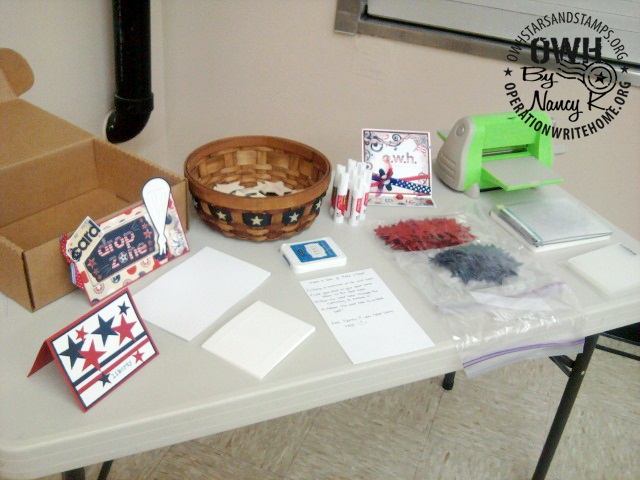 What motivates you to make cards for our heroes? I have to say that the thing that keeps me coming back to OWH is the constant stream of inspiration, motivation and friendship that I have found at places like the Stars & Stamps blog and the Facebook page! Since I love teaching and sharing the love – I have also grown to love having a “Make and Leave” OWH booth at local scrap crops (Thank you, Kim, from Express the Moment!) At my booth, I can share the OWH mission, spread the word about the Stars & Stamps blog, share techniques and tutorials, and collect huge piles of donated cards. I hope that I have encouraged others to get involved with OWH this way. I know that many of them grow to love it as much as I do. Thanks for all you do for OWH Nancy, and thanks too for the cool digi! Each of your cards is so unique and special, but I'm just loving the hero card! I'm always looking forward to those tutorials now too! Nancy, Your cards are amazing especially this first one. Just wonderful. You have a great idea there having a booth in your LSS. Maybe I can try something like that here in our LSS. Thanks for sharing your card and a little bit about yourself. I'm off to your blog now to see some more of your creations. Nancy…I cannot wait to see your first tutorial! I am going to try out that digi. I really like that you look for unusual supplies even from the garage. Keep on working it…your doing great! Nancy, your cards are awesome. Thanks for joining the OWH team and can't wait to see all of your ideas! Good to meet you, Nancy, I've lurked on your blog for sometime. Your digi is awesome & I appreciate you sharing it with us but I really appreciate you spreading the word about OWH! The fact that masculine cards is your forte is a double blessing as I know many of us struggle in that area so you are a true God send! Nancy, These cards are all great and I always enjoy seeing how you manage to incorporate some unusual materials in your work. 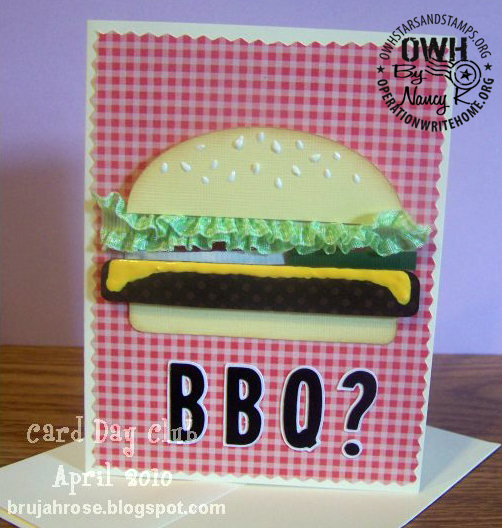 The ribbon lettuce in this burger card is so creative and I just love the collage feel of the first design. I am so glad to be able to share some of your cards and how you've brought OWH to your local community! Nancy, your cards are wonderfully creative! Thanks for sharing your cards, and I'm looking forward to seeing your tutorials! Wow! What great cards. I love the 'heroes' card… Pat K.
Nancy,Love your cards! Each one is a work of art.Looking forward to your tutorials! Fantastic cards! You have some wonderful ideas. Wow Nancy your cards are wonderful!!! I really love the hero card! Thank you for all you do and I'm really looking forward to the tutorials.Thank you for sharing.